In the fall of 2016 my wife and I watched our 10 month old son struggling to pick his bottle up off the floor. It quickly became obvious that his chubby little hands were too small to pickup his bottle. 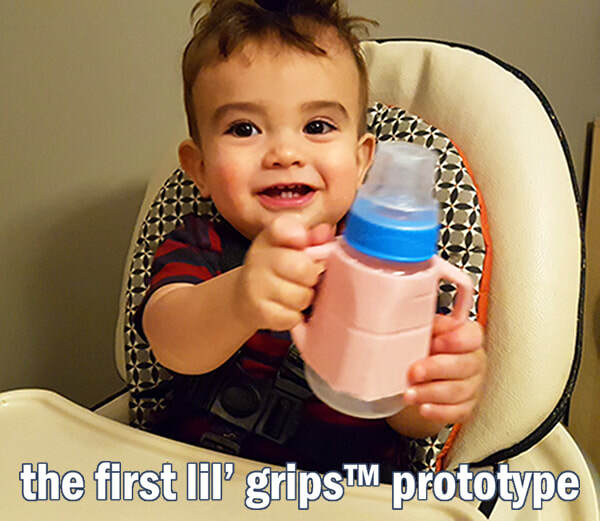 I headed to my 3D printer and a short while later, the first homemade silicone lil' grips® prototype was on a bottle and firmly grasped in his tiny hands. ​His big gummy grin let me know it was a hit! and dahdoOo's first product, lil' grips®, were born! Friends starting asking where I got the little handles from and I couldn't keep making them by hand in the basement so we took the plunge and launched full production in late 2017! dahdoOo is inspired by the daily adventures of babies, toddlers and fueled by a desire to get creative and have fun! dahdoOo is dedicated to producing the highest quality products that are safe, fun and innovative! All of our products are third party tested and certified to ensure the highest levels of quality and safety. Thanks for all your support! We hope you find our products fun, innovative and helpful! We've got many more cool and original products coming down the pipe! Don't miss out! Subscribe to our instagram @dahdooo or follow us on facebook for the latest and greatest releases and special deals. SAFE for your little ones.